Vaiden loves riding his John Deere Tractor. He has hooked his wagon to the back so he can pull "loads" of stuff all over the yard. He begged me to let Whitten ride, so I allowed it (mainly because I knew it would be a really cute picture!!) I am so glad I got this shot because one day, my two boys will look back at this and know that they loved each other from the moment they met!! As I was telling you, Whitten is very interested in walking (71/2 months old now). He loves to push his~what Vaiden calls~ "shopping cart" around. He does really well walking behind the cart!! Two funny things: (1) as you can see from the pictures, he is still so little, will he walk on those little legs?? (2) he laughs the entire time he is pushing the cart, I guess he is really happy about walking!! Whitten has gotten so brave at standing and moving around on his feet. He was playing around in the playroom on Saturday and fell and hit his eye on a chair that was turned over. The little bobo bleed for a bit then he was off playing again. A least he is a tough little guy!! Vaiden's obsession these days is his bike!! From the time he gets up in the morning until he goes to bed, he wants to ride his bike. He really has gotten to be a great bike rider and is getting a little too comfortable for my liking. The second Michael pulls in from work in the afternoons, Vaiden is at his door begging his Daddy to take him on a bike ride. The neighbors gave us an old bike that was too small for their kids, and Vaiden calls this bike his "practice bike". He is now trying to copy all of Michael's bike tricks. Here are some pictures of him trying to do a "Wheelie". It really is funny to watch him concentrate so much on doing this~a little scary too!! My cousin, Tanya, goes to school at Vanderbilt and since Ole Miss played Vandy this weekend, everyone came into town to see the game. We had a GREAT weekend together, too bad Ole Miss lost!! We had another great weekend with a home ballgame against Samford. The Rebels won!! It was another hot one though. I am so ready for the weather to be cooler, so the Grove experience will be more enjoyable!! Here are some pictures from yesterday...Hotty Toddy Rebels!! I was a little upset with the idea of casts. It was the start of summer and he had just learned to swim and the fact that we were in the middle of moving, and I had a newborn to take care of too. Well, Vaiden didn't mind the casts much. He played like everyone else did, but just a little slower. 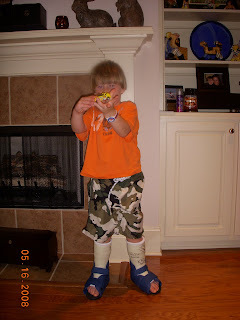 He even played in the mud with Kroger bags over both casts!! He loved it!! At the end of 3 weeks, we were both ready to have the casts off. When they took them off, they stunk soooo bad!! There was grass, dirt, and even a dead ladybug inside. The bad news was that the casts didn't work as expected. So we took the next step~braces. Again, he got to choose the color and this time he chose camouflage!! Three bad things about these braces: 1) Very, very expensive 2) He had to wear them for 3 months 3) Vaiden could take the braces off himself. I was afraid he wouldn't wear them like he should, but he did great. He wore them 24/7 for 2 1/2 months, then the last 1/2 month I slacked off and let him play outside without them. I could tell the braces were working and he wasn't on his toes that much anymore. Vaiden had his follow up appointment with Dr. Purvis on Tuesday of this week. Vaiden had improved so much with his walking!! Dr. Purvis said that we could just wear the braces at night and some during the day, if we could. The only problem is that Vaiden's foot has grown in these past 3 months and the braces are just about too small for him to wear with a shoe. Vaiden is still a growing boy, you know!! The good news came that Vaiden could no longer wear the braces and my mom bought him a new pair of shoes. (My mom has bought every shoe Vaiden has had on his foot!!) Thanks Sittie!! The New Balance shoe size of my 3 1/2 year old is a size 1. When will he slow down?? Vaiden and I went to the Ringling Brothers and Barnum & Bailey Circus last weekend with the Tackett Family. We had such a good a time. Vaiden loved everything in the circus that had bikes involved. The elephants were a favorite too!! The weather was beautiful today!! We hated there wasn't a football game to go to, but we had a day anyway. 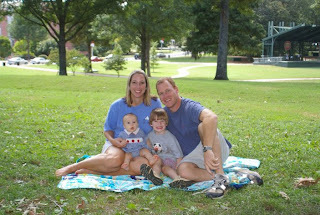 We went to Avent Park and played a little. The boys had a blast. Whitten loves swinging as much as he loves jumping!! After the park, we picnicked in the Grove. There weren't many people there and Michael and Vaiden were able to throw a football, a frisbee, and run all over. Whitten and I played on a blanket and enjoyed the weather!! I hope the weather stays just like today forever!!!! Whitten loves to jump, so Michael and I bought him this Jumperoo several weeks ago. He will literally jump in it for an hour. The funny thing is that he laughs the whole time he is jumping!! He loves it!! We had a great and busy Labor Day Weekend. We started off with the Ole Miss ballgame on Saturday and then Sunday we had an Ellis family reunion at Holmes County State Park. We then drove to Lexington to the Edwards Annual Dove Hunt and Party. We spent the afternoon at the Edwards house and then Monday morning, Michael and the other man hunters tried to kill some dove. They blamed the bad hunt on the weather, who knows?? We still had fun though. Our friends, Angela and Sims McDaniel, came into town and stayed with us at the cabin. 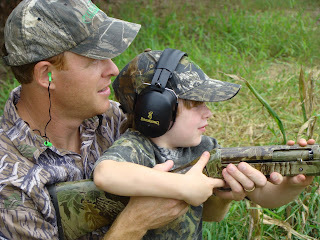 Michael took the boys hunting and they loved it. Good thing they were able to talk and walk around, because they couldn't sit still. 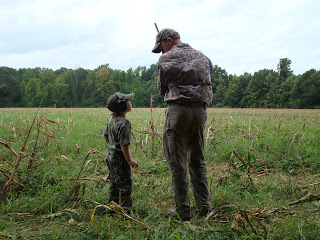 Michael was all about teaching the boys the proper way to hunt and all they cared about was the dead birds they were holding...Boys will be boys!! (LtoR): Joey Tompkins, Brandon Smith, Jason Bailey, Michael, and Jay Tompkins (not pictured: Tripp Bailey) When I meet Michael, I meet his friends. He has 6 guys that he went to school with from 1st to 12th grade at Winona Academy. One friend has~long story short~"left the friendship" but the other 5 are as tight as ever. I was the only girl in the bunch for awhile and then 5 years later, Betsy, came around and just a couple of months ago, Kimberly, came into the group. I am so happy to have some girls to hang out with now!! Anyway, Michael loves these guys and they are truly like brothers to him. Even though they are all in different areas now with families and busy jobs, they always find a way to hang out, golf, or hunt together. I am so thankful that he has these friendships.